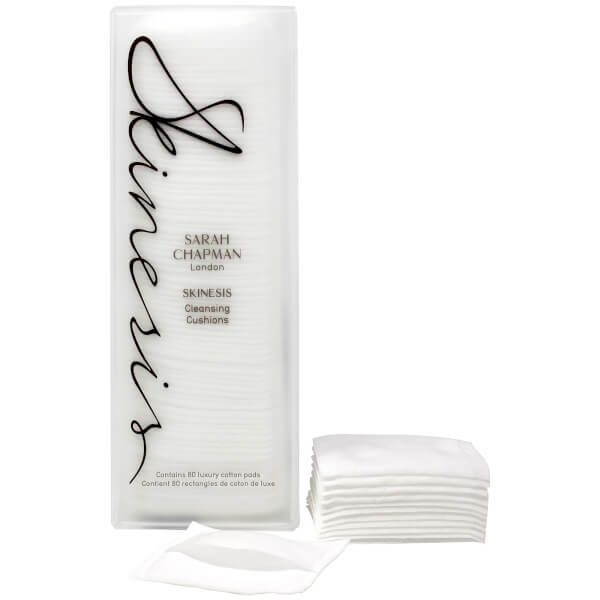 Go au naturel before bedtime with the Sarah Chapman Skinesis Cleansing Cushions; a pack of 80 luxury cotton pads used to apply liquid exfoliants, remove makeup or simply cleanse the visage. Crafted with pillow-soft layers of highly absorbent cotton, each pad ensures effective but gentle delivery of your cleansers and makeup removers. Arrives with an easy-to-hold, ergonomic finger pocket for enhanced dexterity and hygiene. Abrir el envase con los dedos, echar una cantidad apropiada de producto y extender por el rostro o los ojos para retirar el limpiador, el maquillaje y la suciedad.